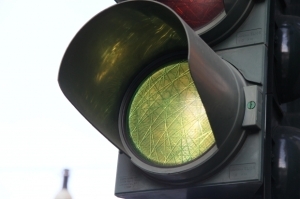 Traffic Lights that Reduce Congestion and Collisions? Traffic lights are an important part of street design and they are created to control traffic flow while preventing motor vehicle collisions. Given accident rates in general and the number of intersection collisions in Hollywood and other cities, however, many experts feel that more can be done to make streets and traffic lights safer. One of those potential solutions is “smart” traffic lights. Smart virtual traffic lights developed by scientists promise to reduce collisions, red light violations, and congestion. The lights work by allowing cars to communicate with each other and with traffic light systems. If two or more cars are approaching an intersection, the system would make the lights turn green for the car or cars with the right of way and red for everyone else. If there is only one car approaching the intersection, the traffic lights would allow that car to drive right through on a green light. Current traffic lights work automatically on a timer, so that whether an intersection is busy or completely empty the lights cycle through red, yellow, and green lights at equally timed intervals. The amount of time given to each light is based on expected use of an intersection. The problem is that when there is congestion the lights continue in the same pattern, even though a different timing of lights could actually ease the traffic buildup. This leads to frustration for drivers and sometimes even collisions. It can also contribute to drivers running red lights. If a driver approaches a red light and sees that there is no traffic nearby, sometimes the motorist is tempted to drive through the light. Some experts suggest that virtual lights would reduce these risks by allowing vehicles to communicate with one another. It is possible that the virtual lights could eventually become obsolete if car-to-car communication in the future allows cars to project directions and instructions on the windshield or dash. According to researchers, the system could even save lives by allowing emergency responders to get to an emergency site faster. With car-to-car communication, an ambulance or fire truck could approach intersections more easily and more quickly, since the system would already have directed cars out of the way, allowing responders to get to the scene faster. Critics note that virtual lights and smart roads are still prohibitively expensive for many communities. They also question how effective the roads would be on their own – without self-driving cars that would automatically get out of the way. Critics argue that driver actions and attitudes continue to be a big contributor to many collisions and could potentially stay a problem even with smart traffic lights and roads. That is, a driver may approach an intersection with smart street lights and still choose to drive through a red light or still fail to yield to an emergency vehicle even if warned to do so. If you have been injured by a dangerous or negligent driver or if a member of your family has been injured or killed in a traffic accident, Flaxman Law Group is always standing by to offer a free case consultation. Contact our law firm today for your free appointment.